I love browsing through my grandmother’s photo albums, especially, searching for visual glimpses of her life before or during World War II, before and during the Soviet, then Nazi and then again Soviet regime. There are not many photos to find.. First of all, they were a simple farming family who did not have many photographers around their village. Secondly, the war, deportation of her parents to Siberia, confiscation of their family farm, scattering of family to all corners of Latvia and Lithuania, hiding in the post-war years… I am amazed that there are any photos left at all. 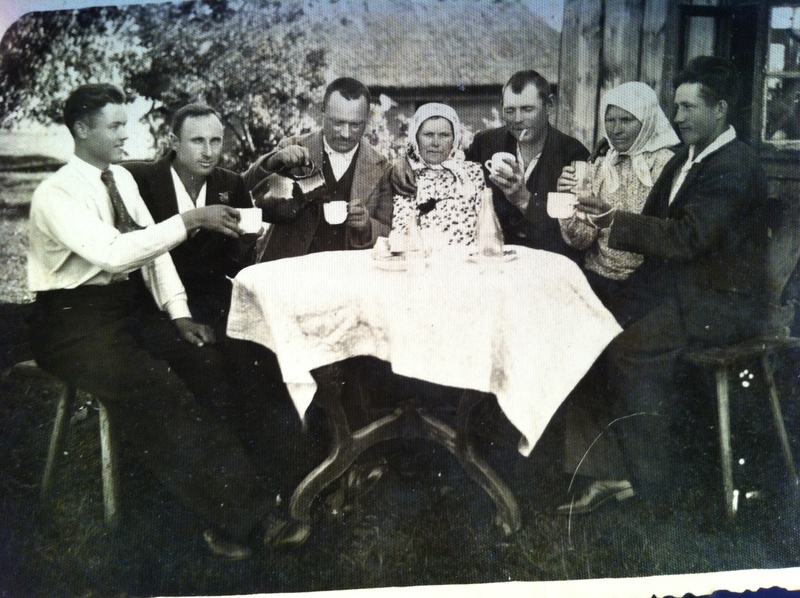 This is possibly the last photo of my great-grandparents Jānis and Margaret (sitting in the middle) and their eldest son Miķelis (on the far left) enjoying life, family and friends at their farm in Butinge, Lithuania. This territory belonged to Latvia until 1921 therefore most of the local population in surrounding area were Latvians. The photo could be taken circa 1942-1943. In the autumn of 1944 their village was again taken over by the Soviet troupes. In 1944 two of my grandmother’s brothers, including Miķelis, crossed the Baltic Sea as refugees and in 1948 my great-grandparents and great-great-grandmother (who was well into her 90-ties) were arrested and deported to Irkutsk region in Russia. They were allowed to return to Latvia only in 1957, few years after Joseph Stalin’s death. They had nowhere to go since the farm was confiscated, except move from place to place to stay with their children who themselves were struggling to find places to live. Plus, anyone, who had been deported, carried the sentence of “enemy of the state” for the rest of their lives, making it very difficult to re-settle. You were discriminated and marked (as if with leprosy in Jesus times) and some avoided you for fear of the regime. Here is my family. Almost 80 years since this photo was taken. Three to four generations that are connected with a particular memory, a particular story and this story tells of a very deep trauma. There is the first generation – my grandmother, her siblings, her parents – who experienced it first-hand. Often if the experience has been very traumatic, this generation becomes the “silent” generation, focusing on survival. In our family, this would be my grandmother’s generation. But there was an added layer of trauma – in the Soviet Union they were not allowed to talk about it. These memories were simply “erased” from public memory and official history because they did not match the ideology of the regime. When the memory is repressed, there is no chance for healing. Then there is second generation which grows up with these “silent” parents. Even though my grandmother has never been the silent type, she was afraid to tell many details of her past to her children and grandchildren. Not until Latvia started shaking off the totalitarian Soviet regime and became an independent country again. Suddenly there was a flood of stories. Being the fourth generation in this chain of communicative memory, I now regret that I did not ask more questions before my grandmother’s memory got badly damaged by old age and before my mom passed away from cancer. Recently I got a stark reminder how deeply this trauma still affects the older generation of Latvian society. My grandmother is the most cheerful, positive person I know but she started to complain about bad nightmares which she could never remember the next day. Only word she kept repeating was “mud” and “wading through mud”. One morning while I was staying with her few weeks ago, she woke up from another one of those nightmares. Only this time she could remember it and described it to me in vivid detail. The thing is… my grandmother herself was never deported (someone had warned her and she went into hiding). Her parents were and so were many of her neighbors and friends. This was a collective trauma which affected so many families in Latvia, Estonia and Lithuania. In Latvia alone, on March 25, 1949, approximately 43 000 people were arrested and deported to Siberia. It took 31 train cars to transport them on the long journey across Russia. I can’t even imagine the irreparable damage of generations of memory for all the refugees from the 10/40 window with the traumas they have endured from the modern-day terror wars. This kind of thing truly changes the family tree. Yes, I also think about the people in Syria, other war-zones and totalitarian states like North Korea when I write these posts.